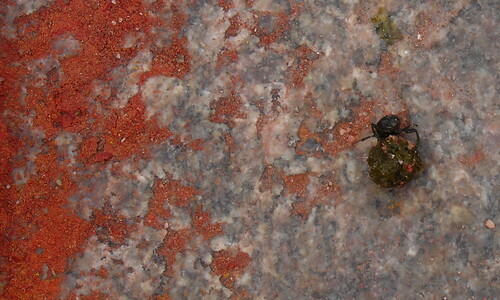 Dung beetle, originally uploaded by jrambow. 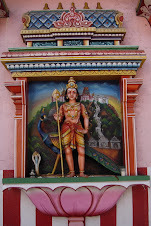 The Chamundi temple is at the top of a hill with 1000 stone steps leading down to Mysore itself. Pilgrims walk up, but Don and I took a car up and walked down. Just about every one of the steps had a pile of red and yellow powder on it. The piles were slowly expanding as people walked up, adding a little to the pile each time as a way of puja, or worship. I think I only saw women putting down the powder. But there's not just powder on the steps. Of course there's also manure here and there from cattle and other animals. Here's a little dung beetle taking advantage of the free food supply. I like how he caught a few specks of color up in his ball.